Dr. Peter Toon, long-time President of the Prayer Book Society and editor of their publication MANDATE passed away on Sunday. He was also my systematic theology and ascetical theology professor at Nashotah House Seminary. Peter, son of Thomas Arthur and Hilda Toon, was born in Yorkshire, England, soon after the start of World War II. After him came Paul, David and Christine. He attended Hemsworth Grammar School, Cliff College, Sheffield; King’s College, London; The University of Liverpool and Christ Church, Oxford University. He held three Masters’ degrees and a Doctor of Philosophy degree from Oxford. He was married to Vita for forty-seven years and they have one daughter, Deborah, who lives in California, and is married to Michael, a Naval Officer. Vita is a graduate of London and Oxford Universities, while Deborah is a graduate of Vanderbilt University in Nashville and the University of Texas at Austin. After teaching religious studies in a College, Peter was ordained in the Church of England in 1973 in the Diocese of Liverpool. Since then he has served in parishes in both England and the U.S.A. and also as a theologian in theological houses in the U.S.A. and in England. In the last decade of his working life, he served the Prayer Book Society of the U.S.A. as its President and C E O.
Peter wrote and had published over twenty-five books, together with booklets, essays, articles. He also wrote many opinion pieces for the web. He edited Home Words in England from 1985-2001 and The Mandate in the U.S.A. from 1995 to 2008. He was much committed to The Anglican Way as Reformed Catholicism, and to the importance of the historical Formularies—Articles, BCP and Ordinal. The woes of the Anglican Communion in recent days much distressed him. As he died on Saturday, April 25th in San Diego, and as virtually all Vita’s and Peter’s relatives and friends are thousands of miles away, there was no public funeral in California, only a service for the family based on the classic BCP. It is hoped that his remains may be interred in the family grave in Yorkshire. ...I am a solo clergyman on staff. At Good Shepherd, Rosemont, PA I was the curate, with a rector and two other priests (a local boarding school chaplain and a retired Villanova University professor). At St. Mary's in Charleroi, PA I was the Rector and I had a vocational deacon on staff, who had been there over 30 years. And of course here at St. John's Fr. Bedford was on staff (as well as having a curate for a little while). Now 14 years after being ordained I am flying solo for clergy. (also interestingly the diocese the ordained me has left the Episcopal Church, that first parish is in litigation about leaving the Episcopal Church, and the second parish and its diocese has also left the Episcopal Church). Although the audio for his final sermon while on staff can be best heard through the St. John's website http://www.stjohnsdetroit.org/sermons/ (which can also be downloaded onto your iPod/Mp3 player) I have also downloaded some video of Father's sermon, as well as the recognition plaque awarded at the end of the service. ...when the Tigers play on the West Coast. I stay up too late watching half, or maybe 2/3 the game. Shoot - the Angels just tied it up at 5 in the bottom of the 5th with 2 on and no outs. Come on Verlander - let's get some outs! From The Living Church website. The part in BOLD in the article is my emphasis. An estimated 300 clergy and lay delegates from the Diocese of Michigan met April 18 for a six-hour special convention to address an anticipated $1 million diocesan deficit. Meeting at the Cathedral Church of St. Paul, Detroit, delegates ranked funding priorities from among 17 categories and reviewed long-term strategy options for use by diocesan council as it seeks to reconcile income and expenses. Ministry with youth and young adults was ranked as the top priority, with congregational vitality a close second and discernment and training for ministry finishing third. Evangelism and total ministry, or ministry of all the baptized, tied for last. The special convention was scheduled during the annual convention last October when delegates approved a $2.9 million budget for 2009 which included the use of principal from the Extended Ministries Fund to cover an expected $985,835 shortfall in income. In several letters to the diocese prior to the special convention, the Rt. Rev. Wendell Gibbs, Bishop of Michigan, announced that five diocesan staff positions would either be eliminated or left vacant. He also postponed the launch of the first phase of a diocesan-wide survey that was to have cost more than $300,000. Bishop Gibbs also noted that the estimated $2 million in income, primarily from contributions made by diocesan congregations, may have been overly optimistic. Other cuts are expected when council meets again on May 9. Left unresolved by the convention was an ongoing theological debate within the diocese over the use of the $7.1 million Extended Ministries Fund. Some diocesan leaders advocate leaving the principle untouched and using only a portion of dividends to provide a modest but predictable revenue stream. Others believe that the principle of the fund should be tapped in order to support new or imperiled ministries, particularly during times of economic distress. The Record, the newspaper of the Diocese of Michigan contributed to this report. We saw this today in the parking lot at the hardware store. 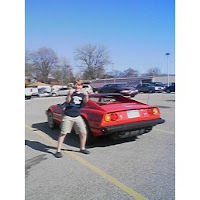 It is Andrew's dream car. He better get that MLB contract if he wants one of these. Personally, I would be afraid to drive it, and would be like the owner of this car who parked it very far away from the store so no one would park near it! Baseball, of course. Two practices again with my boys. This time I had an hour between the Tigers (Major league with Sam and Andrew) and Rangers (Double A with William). Enough time to get home and apply ice! It is a new shoulder pain, different from last year (perhaps the therapy over the winter fixed that problem). 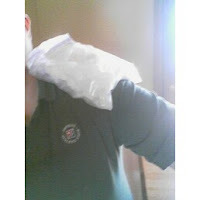 But this year I get to ice my elbow as well since I am over-compensating for the shoulder. I love all the happy faces! Thanks be to God! Wow - flashback to my childhood. Mark "The Bird" Fidrych is dead at 54. Here is an excerpt from the AP report. BOSTON (AP) — Mark Fidrych, former All-Star pitcher nicknamed “The Bird” whose career was shortened by injuries, was found dead today in an apparent accident at his farm. He was 54. Worcester County district attorney Joseph D. Early Jr. said a family friend found Fidrych about 2:30 p.m. Monday beneath a dump truck in Northborough, Mass., about 35 miles west of Boston. He appeared to have been working on the truck, Early said. Joseph Amorello said he had stopped by the farm to chat with Fidrych when he found the body underneath the 10-wheel truck. Amorello owns A.F. Amorello & Sons, a company that does road construction, and said he sometimes hired Fidrych to haul asphalt or gravel in the truck. The district attorney’s office declined to release details of the accident or the discovery of Fidrych. The curly haired right-hander was the American League Rookie of the Year in 1976 when he went 19-9 with a 2.34 ERA and 24 complete games. But injuries cut short his career, and he ended up spending only five seasons in the major leagues, all with the Tigers. He was 29-19 with a 3.10 ERA. Fidrych attempted a comeback in 1982 and 1983 in the Boston Red Sox organization. He pitched for their Triple A team in Pawtucket, R.I. But he never pitched in the majors after 1980 and retired in July 1983. The Worcester, Mass., native later owned a trucking business. State police detectives are investigating the circumstances of his death, Early said. He acquired the nickname “the Bird” because of his resemblance to the Big Bird character on the Sesame Street television show. During games, he would bend down and groom the mound with his hands, talk to the baseball and slap five with teammates in the middle of the diamond. “People that didn’t know him might say he was weird,” Amorello said, “but people who knew him didn’t. He was just a big-hearted person. He never even slightly suggested any regrets of his injuries. He was just happy to have the time he had in sports. He considered himself a lucky man. Fidrych married his wife, Ann, in 1986 and they had a daughter, Jessica.Knee and shoulder injuries limited him to 58 major league games. “Baseball will miss him. They missed him because he didn’t have as long as a career as everybody would have liked in the first place. It’s just horrible,” former Orioles pitcher and Hall of Famer Jim Palmer said. “He did embrace life. I remember him trying to play golf when he couldn’t play golf and enjoying every minute of it. Fidrych’s first major league start was a complete game, two-hitter in which he beat the Cleveland Indians 2-1. He won seven of his first eight decisions and was the AL starter in the All-Star game. He allowed two runs in the first inning and put runners at second and third in the second, but he got the final two outs and left after two innings trailing 2-0. The NL won 7-1. He tore knee cartilage during spring training the following year and was placed on the disabled list until May 24. He sustained a shoulder injury in July 1977. Fidrych pitched 250 1-3 innings in 1976 but only 162 after that when he was just 10-10. Chicago Cubs bench coach Alan Trammell was a rookie shortstop with Detroit in 1977 and saw Fidrych’s on-field behavior up close. “He was very genuine. It was not an act,” Trammell said. “He never changed. He liked to have a good time. You’d go over his house and he’d make dinner. That’s the type of guy he was. The Triduum is always wonderfully theologically satisfying - and combined with Easter absolutely exhausting! Maundy Thursday was good, albeit a small attendance. I often think about how our Lord's Last Supper was only with his inner circle, and Maundy Thursday always had that intimate feel, no matter where I go. After the service we had the garden watch, which I had to dash away from after a frantic call from home. Meg had fallen off a chair and bit through her tongue. Lots of blood, but thankfully not completely severed. But a stress anyway (now 4 days later she is well on the way to complete healing). Good Friday had the potential for complete chaos. It was also Opening Day which is a drunken carnival in downtown Detroit! We stood fast and had our 12 to 3 service despite the 1pm start for the game. We took advantage of the conflict by speaking with the media and getting some P.R. over the whole thing. I had a 4 minute live interview on WJR with Frank Beckmann, and had some mentions in the Detroit News, Free Press, and by WJR host/columnist Paul W. Smith. The jist of my discussions was that although we were not happy about the scheduling of opening day on Good Friday, we understood the reality that even on the day Jesus was crucified much of the city went on with their business too. And we invited people to come even if it was only for the first portion of the service before the game. Although some of our parishioners stayed away due to the perceived difficulties of getting to St. John's due to the game (those who game said it took longer, but access was easy with our side gate open on the service drive), we had LOTS of visitors who stayed for some of the service. Probably a 50% increase in people who came and stayed for a part of the service. And we had many more donations from people who came in to use the bathrooms! One strange 'highlight' is that at the end of one of the choir's solemn pieces, the F-15 flyover occured from the national anthem next door! The Easter Vigil attendance was also smaller than last year - we had a slew of baptisms last year. This year we had one - Ray Spencer. Ray came to St. John's the first time because of Sharon Schafer's funeral and has been taking the Alpha Course. I LOVE the liturgy of the Easter Vigil! And for Easter we had good crowds for both 8am and 10am Services. I have already posted some video from Good Friday on my youtube channel www.youtube.com/stjohnspriest , and will get around to posting Easter stuff in the next day or two (day off today). The choir (with brass) was wonderful on Friday and Sunday (and the quartet Saturday). They are such a blessing to us. Alleluia, Christ is Risen! The Lord is Risen indeed! Alleluia! With one small correction. I became a Psi U at Penn, not U of M.
Good season, bad season, win, lose or draw, sunny or gray, mild or bitter cold (OK, not too cold!!! ), good times or bad. It almost doesn't matter. The Tigers' home opener is magical. It may be the only game all season some people make. It may be the first of many. It doesn't matter. Everyone is happy and festive. The city is happy and festive. We just finished a fabulous Final Four. Only thing that would have made it better ... well, you know. Historical, whether it's something folks in your family have done for years or whether this was the first time in your new tradition that you just established yesterday. The beer tastes better. Hot dogs never taste as good any other time or any other place. A bit of a problem for Catholics this time, but there was fish available. Even fellow U of M Psi Upsilon brother/Father Kelly had his Good Friday services going next door, so you could cover both holy days of obligation. Lots of smiles you don't see enough of in the city. Lots of music, food and young people carrying on a ritual and tradition that will mean much more to them years from now. Hustle. Bustle. Too much traffic. And that is a good thing. For every bad thing we have faced together, this makes everything OK, even if just for the moment. This is our Masters, with just one competitor on the course that matters to all of us. All of us pulling for one team. All of us looking for this very special victory. Even though there are about a zillion games to go in the season, none is more important than the victory we can get on Opening Day. Unless, of course, it's the last game of the World Series ... at Comerica Park. Paul W. Smith is host of "The Paul W. Smith Show" on WJR (760 AM) from 5:30-9 a.m. Monday-Friday. His column is published on Saturday. What: Tigers' 109th home opener. Detroit 1-3; Texas 3-0. TV/radio: FSD, Channel 2 in Detroit; WXYT-FM (97.1), WXYT-AM (1270). Pitchers: RH Armando Galarraga (13-7, 3.73 ERA in '08) vs. RH Kris Benson (injured in 2007-08). Lineup: Marcus Thames or Jeff Larish should be the DH. The position players figure to be C Gerald Laird, 1B Miguel Cabrera, 2B Placido Polanco, SS Adam Everett, 3B Brandon Inge, LF Carlos Guillen, CF Curtis Granderson and RF Magglio Ordoñez. Pregame ceremonies: Start at 12:35 p.m.
George Kell: Tigers will honor their Hall of Fame third baseman and legendary broadcaster who died last month. National anthem: Members of the Detroit Symphony Orchestra. Flyover: Four F-15C aircraft from the 95th Fighter Squadron based at Tyndall Air Force Base near Panama City, Fla. The pilots are known as Boneheads. Kid Rock: The musician from Romeo will deliver the baseballs to the mound. Loretta Abiodun: A 35-year employee with General Motors, she works in quality/communications at Detroit-Hamtramck Assembly. David Edgar: A 34-year employee with Chrysler, he's a sheet-metal worker at Warren Stamping. Pete Reyes: A 22-year employee with Ford, he's the chief engineer of the Taurus at the Dearborn product development center. Well, there have been far worse forecasts for the home opener. At game time it should be about 48 degrees and cloudy but little chance of rain, according to National Weather Service meteorologist Dave Gurney. The Tigers have been criticized in some circles for playing this game during one of the holiest afternoons on the Christian calendar. The team will offer fish fry meals at Big League Grill and Great Fry Stand. Services at its neighboring churches: St. John's Episcopal Church, noon-3 p.m.; Central United Methodist Church, 7 p.m.
Our baseball practice cancelled due to snow (where is the global warming when you need it?). Tiger's opener (away) and they get slapped around 12 to 5. And MSU loses in the National Championship game.